In the early 1940s, Edward F. Burton began to investigate ways to simplify bomber aircraft. Burton was the Chief of Engineering at the Douglas Aircraft Company (Douglas), and he had noted that each subsequent generation of bomber aircraft was substantially larger, more complex, and more expensive than the preceding generation. Burton and his team started with a clean sheet of paper and designed what would become the XB-42. The Douglas XB-42 Mixmaster had a unique design that provided very good performance. However, it was too late for World War II and too slow compared to jet aircraft. The first prototype (43-50224) is seen with its short tail on an early test flight. Acting on their own, with no official United States Army Air Force (AAF) requirement, Burton and his team worked to design a two-engine tactical bomber with a top speed of over 400 mph (644 km/h) and that was capable of carrying 2,000 lb (907 kg) of bombs to a target 2,500 miles (4,023 km) away. The aircraft’s high speed would eliminate the need for extensive defensive armament, which would minimize the bomber’s crew and save weight. 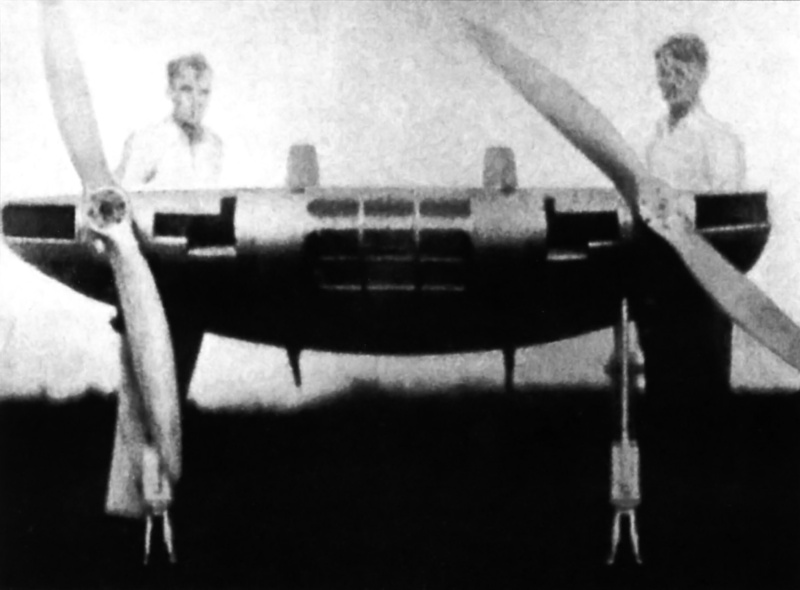 Burton’s team placed the wings, tail, and propellers in their optimal positions; the designers then filled in the rest of the aircraft with the needed equipment. What emerged from the drafting table was the Douglas Model 459: a mid-wing aircraft operated by a crew of three. At the rear of the aircraft were a set of coaxial contra-rotating pusher propellers driven by engines buried in the fuselage. In May 1943, Douglas proposed the aircraft to the AAF, and they were sufficiently impressed to order two prototypes and a static test airframe on 25 June 1943. The AAF originally gave the aircraft the Attack designation XA-42. Douglas had presented the aircraft in a variety of roles that suited the Attack aircraft profile. However, the aircraft was reclassified as a bomber and redesignated XB-42 on 25 November 1943. Unofficially, the XB-42 was given the name Mixmaster, on account of its eight contra-rotating propeller blades loosely resembling a popular kitchen mixer. The Douglas XB-42 Mixmaster was a unique aircraft. It was an all-metal aircraft with a tricycle landing gear arrangement, which was novel at the time. A plexiglass nose covered the bombardier’s position. Atop the fuselage were two separate bubble canopies for the pilot and copilot. At the rear of the aircraft was a cruciform tail; its ventral fin contained an oleo-pneumatic bumper to protect the propellers from potential ground strikes during takeoff and landing. Nose view of the first prototype shows the twin bubble canopies to advantage. Both XB-42 aircraft were originally built with the canopies, but they were disliked. The second aircraft was later modified with a more conventional canopy. The aircraft’s long wing used a laminar flow airfoil and was fitted with double-slotted flaps. An inlet in the wing’s leading edge led to the engine oil cooler and radiator, both fitted with electric fans for ground operation. After air flowed through the coolers, it was expelled out the top of the wing. The main landing gear retracted back into the sides of the fuselage, below and behind the wings. The complex retraction required the gear legs and wheels to rotate 180 degrees. Fuel tanks in each wing carried 330 gallons (1,249 L) of fuel. Four additional 275 gallon (1,041 L) fuel tanks could be installed in the bomb bay to extend the aircraft’s range. In addition, a 300 gallon (1,136 L) drop tank could be installed under each wing. Housed in the fuselage behind the cockpit were two Allison V-1710 engines. Each engine was installed with its vertical axis tilted 20 degrees out from center, and the engines were angled toward the tail. Ducts flush with the aircraft’s skin and positioned below the cockpit on both sides of the aircraft brought induction air to the engines. A row of exhaust stacks was located above the leading edge of each wing, and two rows of exhaust stacks were positioned along the aircraft’s spine. The engines of the first XB-42 prototype produced 1,325 hp (988 kW) at takeoff and 1,820 hp (1,357 kW) at war emergency power. The second prototype had engines that produced 1,675 hp (1,249 kW) for takeoff and 1,900 hp (1,417 kW) for war emergency power. An unusual view of the second prototype (43-50225) that displays the aircraft’s slotted flaps and uncommon main gear retraction that required the legs and wheels to rotate 180 degrees into the fuselage sides. Also visible are the wing guns and revised leading edge inlets, both features exclusive to the second prototype. Extending from each engine was an extension shaft made up of six sections. The shaft sections were like those used in the Bell P-39 Airacobra (which used two sections). The shafts extended around 29 ft (8.8 m) and connected the engines to a remote, contra-rotating gear reduction box from an Allison V-3420-B engine. The gearbox had been slightly modified for the XB-42 and used a .361 gear ratio that was unique to the aircraft. Each engine turned a three-blade Curtiss Electric propeller. The left engine drove the forward propeller, which was 13 ft 2 in (4.01 m) in diameter. The right engine drove the rear propeller, which was 13 ft (3.96 m) in diameter. The engines and propellers were operated independently—if needed, one engine could be shut down and its propeller feathered while in flight. To eliminate the danger the propellers presented to the crew during a bail out, a cord of explosives (cordite) was threaded through holes carefully drilled around the gearbox mount. Before bailing out, the crew could detonate the explosives, which would separate the gearbox and propellers from the aircraft. Two Allison V-1710 engines connected to the V-3420 remote gear reduction for the contra-rotating propellers as used on the XB-42. The power system accumulated over 600 hours on the test stand and never caused serious issues during the XB-42 program. The XB-42’s bomb bay was covered by two-piece, snap-action doors. The bay accommodated 8,000 lb (3,629 kg) of bombs, or a single 10,000 lb (4,536 kg) bomb could be carried if the doors were kept open six inches. The bay was long enough to carry two 13 ft 9 in (4.2 m) Mk 13 torpedoes. Two fixed .50-cal machine guns with 500 rpg were installed in the aircraft’s nose. Housed in the trailing edge of each wing, between the aileron and flap, were a pair of rearward-firing .50-cal machine guns, each with 350 rpg. The guns were concealed behind snap-action doors. Once exposed, the guns could be angled through a range of 30 degrees up, 15 degrees down, and 25 degrees to the left or right. Their minimum convergence was 75 ft behind the aircraft. 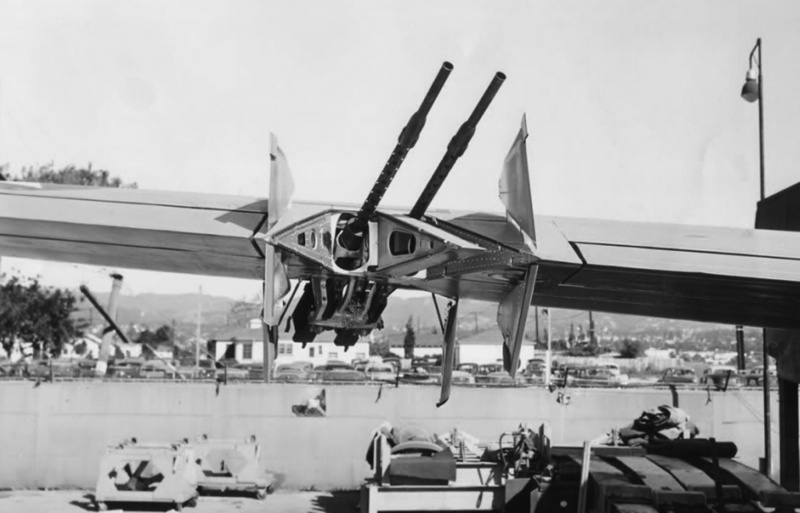 The rear-firing guns were operated by the copilot, who rotated his seat 180 degrees to use the gun’s sighting system. Douglas designers envisioned that the B-42 aircraft could be fitted with a solid nose containing different weapons for different roles. This is the same concept that was applied to the Douglas A-20 Havoc and A-26 Invader. Three of the possible B-42 nose configurations were as follows: eight .50-cal machine guns; two 37 mm cannons and two .50-cal machine guns; or a 75 mm cannon and two .50-cal machine guns. Douglas also thought the aircraft’s speed and range would make it very useful in a reconnaissance role. None of these plans made it off the drawing board. The XB-42 had a 70 ft 6 in (21.49 m) wingspan and was 53 ft 8 in (16.4 m) long. Originally, the aircraft was 18 ft 10 in (5.7m) tall, but the tail and rudder were extended to cure some instability. The extension increased the XB-42’s height to 20 ft 7 in (6.3 m). A brochure published by Douglas in April 1944 predicted the B-42 would be able to carry 2,000 lb (907 kg) of bombs over 5,333 miles (8,583 km) and have a top speed of 470 mph (756 km/h). These numbers proved very optimistic. Perhaps the speed was a misprint, because some sources indicate the anticipated top speed was 440 mph (708 km/h). Regardless, the aircraft only achieved 410 mph (660 km/h) at 23,440 ft (7,145 m), and its cruising speed was 312 mph (502 km/h). The XB-42 had an empty weight of 20,888 lb (9,475 kg) and a maximum weight of 35,702 lb (16,194 kg). The aircraft’s service ceiling was 29,400 ft (8,961 m). Its combat range was 1,800 miles (2,897 km), but additional fuel tanks in the bomb bay could extend the XB-42’s range to a maximum of 5,400 miles (8,690 km). Rear view of the second prototype shows the ventral tail and rudder. Note the oleo-pneumatic bumper on the tail and its minimal ground clearance. The wing guns and new canopy are just barely visible. Construction of the XB-42 proceeded rapidly. The AAF inspected and approved an aircraft mockup in September 1943, and the first prototype (43-50224) was completed in May 1944—one year after the aircraft was proposed and 10 months after the contract was awarded. The XB-42 flew for the first time on 6 May 1944, flown by Bob Brush and taking off from the Palm Springs Army Airfield in California. The second prototype (43-50225) flew for the first time on 1 August 1944, taking off from Santa Monica Airport in California. Both XB-42s were originally fitted with separate bubble canopies. This cockpit layout was not very popular with the pilots. Although they could communicate via intercom, the pilots often found themselves leaning forward to speak with one another face to face under the canopies. The second aircraft was modified with a more conventional single canopy that encompassed both pilot and copilot. While the bubble canopies reduced drag, the single canopy was preferred. Another issue facing the aircraft was that cracks formed in the plexiglass nose. After the plexiglass was replaced several times, the nose was eventually covered with plywood. Both prototypes were heavier than expected, which reduced performance. 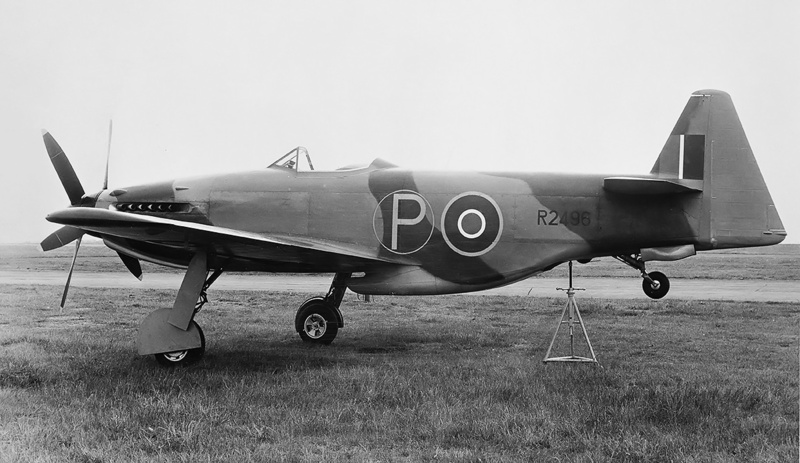 Some work went into lightening the second aircraft, like the use of hollow propeller blades. However, issues with vibrations occurred when disturbed air encountered the propellers, and this phenomenon was exacerbated by the hollow blades. No issues were encountered when the aircraft was clean, but when the bomb bay doors were open or when the gear or flaps were deployed, the vibration issue occurred. Some pilots lived with the vibrations and dismissed the issue, but other pilots found it very disconcerting. An improved propeller was designed that featured reversible blades to decrease landing roll and to slow the aircraft in flight. However, it was cancelled in March 1945 and was never built. Front view of the second prototype illustrates the aircraft’s revised canopy. The canopy on production aircraft would have been similar but more refined. Again, note the tail clearance and wing guns. Some cooling issues were encountered, and modifications to the air intakes were made to improve airflow. The main gear was also modified a few times to improve its retraction and performance. Overall, the aircraft flew well, but the controls were not well harmonized. In addition, the XB-42 aircraft would encounter a slow dutch roll oscillation if not counteracted by the pilot. As previously mentioned, the tail of the aircraft was enlarged to resolve the issue, but it was never entirely solved. The XB-42 required a very long takeoff run of some 6,415 ft (1,955 m). Because there was only about 9 in (.23 m) of clearance between the ventral tail and the ground, the aircraft needed to build up a substantial amount of speed before it was carefully rotated for liftoff. 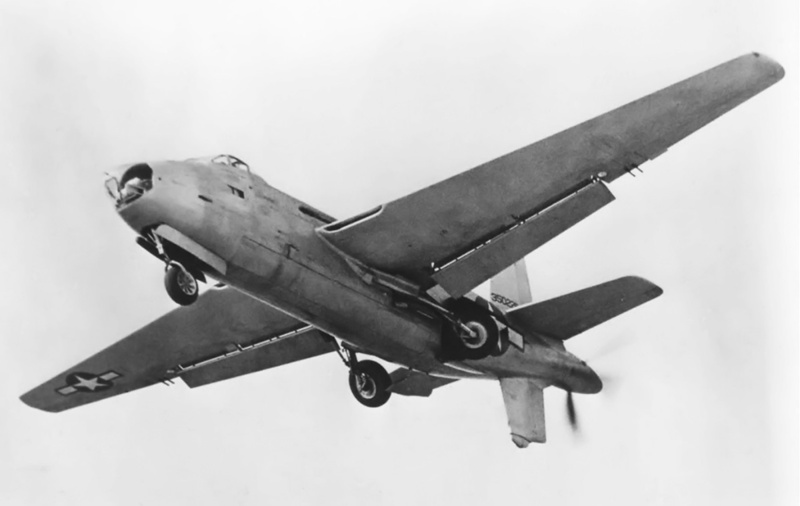 The second XB-42 prototype was the only aircraft to have revised wing inlets and to be fitted with its machine gun armament, although the guns were never tested. The second aircraft was flown around 70 hours before it was turned over to the AAF. On 8 December 1945, Lieutenant Colonel Henry E. Warden and Captain Glen W. Edwards flew the second XB-42 from Long Beach, California to Bolling Field in Washington, D.C. The record-setting, point-to-point flight covered 2,295 miles (3,693 km) in a time of 5:17:34—an average of 433.6 mph (697.8 km/h). The XB-42 had benefited from a favorable tailwind, and the aircraft’s average true airspeed was around 375 mph (604 km/h). The guns in the left wing are seen aimed 30 degrees up and 25 degrees inboard. Only the second aircraft was fitted with the guns, and they were never tested. Note the snap-action doors that covered the guns. When open, the doors increased the XB-42’s directional stability, resulting in additional rudder force to give the desired yaw. On 16 December 1945, the second XB-42 was lost during a test flight near Bolling Field. The aircraft was in a landing configuration when there was an issue with extending the landing gear. While the crew was troubleshooting the problem, the left engine began to overheat and then died. The right engine was taken to full power and began to overheat. The decision was made to bail out, and two of the crew safely jumped free before the pilot remembered to jettison the propellers. The propellers and their gearbox were successfully severed from the XB-42, and the pilot bailed out. All three crew members survived the ordeal without any injuries, but the aircraft was completely destroyed. An exact cause of the crash was never determined, but it was speculated that the coolant doors were inadvertently left in their nearly-closed landing configuration while the crew investigated the gear issue. This resulted in the engines overheating. At the same time, a fuel tank switch was made a bit late and probably led to fuel starvation of the left engine. The second XB-42 had accumulated a little over 118 hours of flight time when it crashed. The first XB-42 prototype had made 42 flights and accumulated over 34 flight hours by 30 September 1944. A year later, that number rose to around 150 flights, with the aircraft accumulating around 125 flight hours. 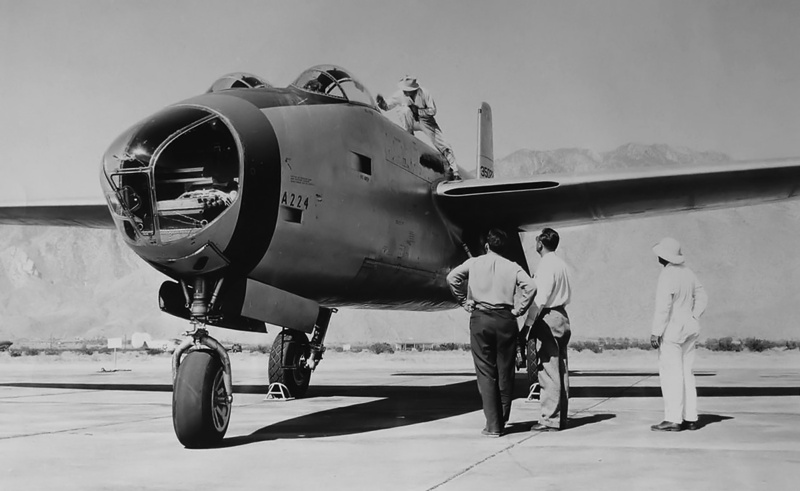 Before the XB-42 had even flown, Douglas contemplated adding jet engines to the aircraft. An official proposal for the modification was submitted on 23 February 1945. The proposal was approved on 8 March 1946, and modifications to the aircraft began on 26 June 1946. 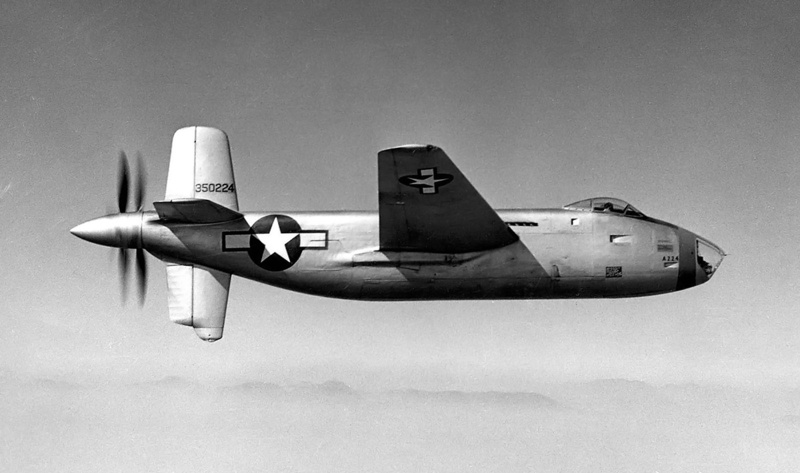 At the time, the first XB-42 had made 168 flights and had flown around 144.5 hours. The two Westinghouse 19XB-2A (J30) jet engines were finally delivered in October 1946 and were installed on the aircraft. Rear view of the XB-42A illustrates the notches in the new flaps to avoid the jet exhaust. The rest of the aircraft remained relatively unchanged from the XB-42 configuration. The cooling air exit can be seen on the right wing. Note the various Douglas aircraft in the background. 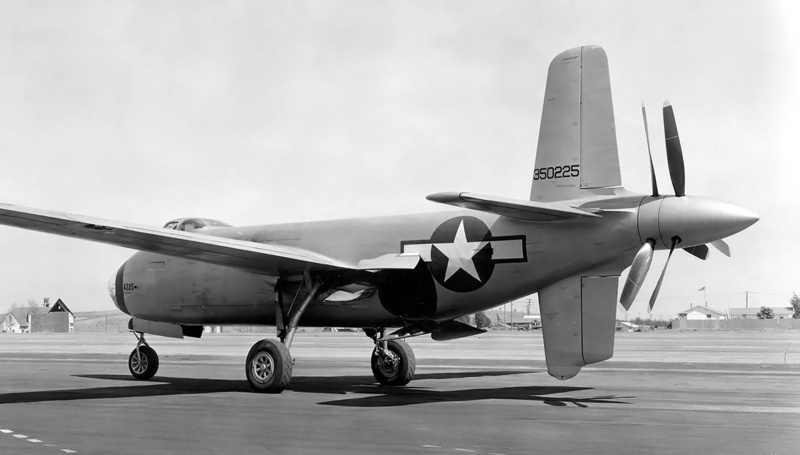 With the jet engines added to the first prototype, the aircraft was redesignated as the Douglas XB-42A. The 1,600 lbf (7.12 kN) thrust jet engines were mounted under the aircraft’s wings. New flaps were installed that were notched behind the jet engines. The notches allowed the flaps to avoid the jet exhaust when they were deployed. The fuel tanks in the wings were modified because of the jet engine mounts. Total wing tankage was decreased by 154 gallons (583 L), but two additional 74 gallon (280 L) tanks were installed in the fuselage. The jets themselves burned the same fuel as the piston engines. The aircraft’s instrumentation was also modified to accommodate the jet engines. The XB-42A is listed as having a 70 ft 7 in (21.51 m) wingspan and a length of 53 ft 10 in (16.4 m). In reality, the wingspan was probably the same as the XB-42, and the length was slightly longer due to a different spinner. The aircraft’s height was 20 ft 7 in (6.3 m). The XB-42A had a predicted maximum speed of 488 mph (785 km/h) but only achieved 473 mph (761 km/h) at 14,000 ft (4,267 m); cruising speed was 442 mph (711 km/h). The XB-42A had an empty weight of 24,775 lb (11,238 kg) and a maximum weight of 44,900 lb (20,366 kg). The aircraft’s service ceiling was 34,500 ft (10,516 m). The XB-42A had a normal range of around 1,200 miles (1,931 km), but a maximum range of 4,750 miles (7,644 km) could be achieved with additional fuel tanks in the bomb bay. 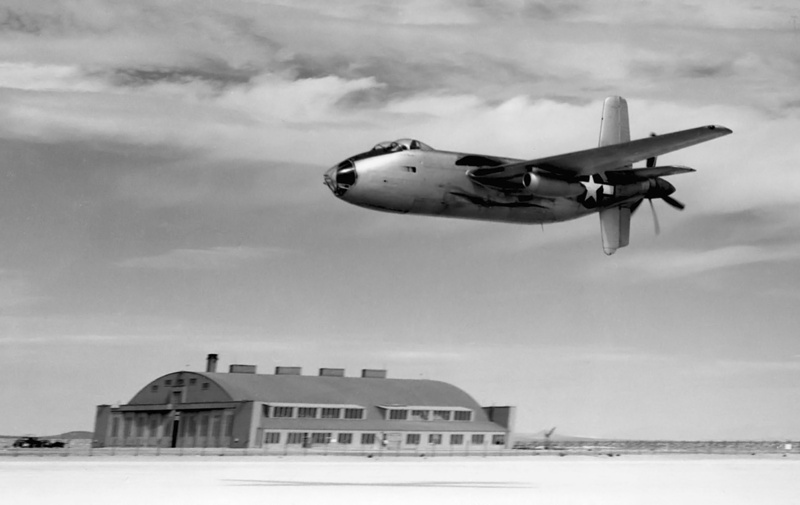 The XB-42A makes a low pass over Muroc Air Base during an early test flight. Note the exhaust stains above the wing and the oil stains below the wing. The aircraft was outclassed by other jet aircraft, including its XB-43 cousin. The first flight of the XB-42A (still 43-50224) occurred on 27 May 1947 at Muroc (now Edwards) Air Base in California. The aircraft required a lot of maintenance and did not prove remarkable in any category to justify further development. Despite the increased performance, the XB-42A was perched on the awkward dividing line between piston-powered aircraft of the past and jet-powered aircraft of the future. There is no better indicator of this than the fact that Douglas had already moved forward with an all-jet XB-42 aircraft, designated XB-43. The Douglas XB-43 Jetmaster had its jet engines buried in the fuselage, near were the Allison engines were installed on the XB-42. 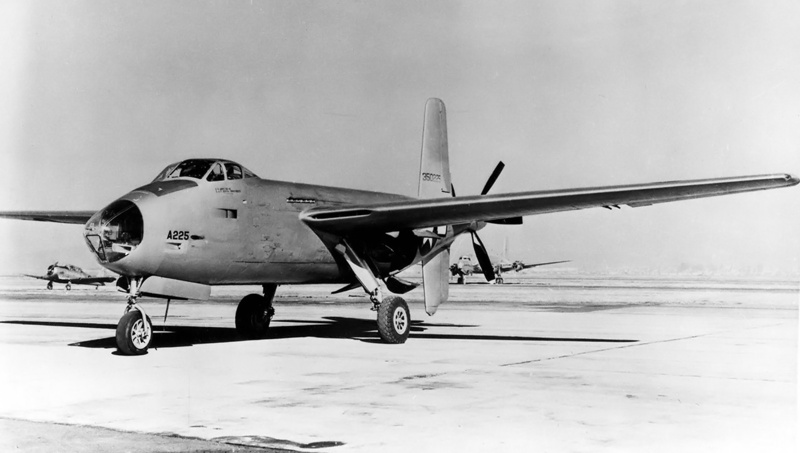 The first XB-43 was built using the XB-42 static test airframe. The jet-powered XB-43 made its first flight on 17 May 1946—little more than a year before the jet/piston-powered XB-42A first flew. The XB-42A made only 23 flights, accounting for a little under 18.5 hours of flight time. With technological progress outpacing the XB-42A, the aircraft was donated to the Air Force Museum on 30 June 1949. It was later moved to the National Air and Space Museum’s Paul Gerber Facility in Silver Hill, Maryland, where it was stored for a number of years. In 2010, the XB-42A was transferred to the National Museum of the United States Air Force in Dayton, Ohio. The aircraft, along with second XB-43 prototype, will eventually be restored for static display. Douglas persisted with the pusher configuration and designed a number of other military and commercial aircraft. The most developed design was that of the Model 1004, which was actually designated DC-8. Known as the Skybus, the aircraft was similar to an XB-42, but with an extended fuselage for airline service. The aircraft could seat a maximum of 48 passengers, and the extension shafts from the Allison engines traveled under the passenger compartment. First proposed in October 1945, the Skybus was never built, and the DC-8 designation was reapplied to Douglas’s first jet airliner. 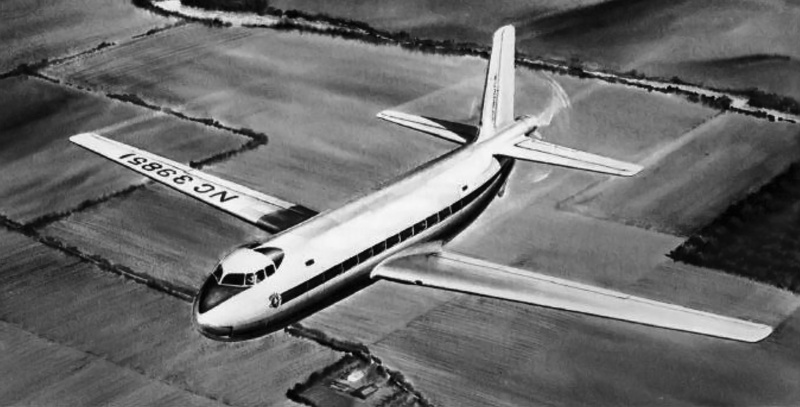 Although visually similar to the XB-42, the Douglas DC-8 Skybus was an entirely new design. The aircraft’s excellent performance and great single-engine handling was not enough to justify its expense over more conventional designs. This entry was posted in Aircraft, World War II on 5 August 2017 by William Pearce. On 12 September 1942, the Martin-Baker MB3 fighter crashed after its Napier Sabre engine seized. Company co-founder Captain Valentine H. Baker was killed during the attempted forced landing. James Martin, the aircraft’s designer, had already designed the MB3A, which was the production version of the MB3 that incorporated several changes to enhance the fighter’s performance. The second MB3 prototype was to be completed as a MB3A. After the MB3 was destroyed and Baker was killed, Martin wanted to further alter the aircraft’s design to improve its safety and performance. Perhaps the paramount change was to replace the Sabre engine with a Rolls-Royce Griffon. 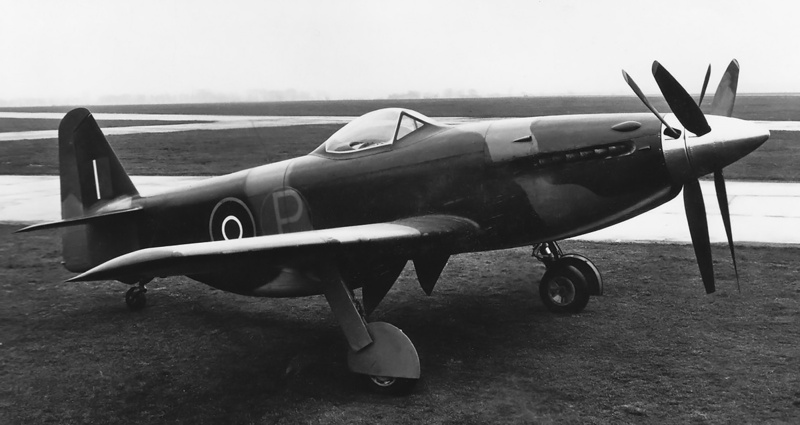 The Martin-Baker MB5 was one a few aircraft that sat at the pinnacle of piston-engine fighter development. Here, the aircraft is pictured at Harwell around the time of its first flight. The Rotol propeller is installed but the 20 mm cannons are not. The British Air Ministry doubted the quick delivery of the two MB3 prototypes still on order and was agreeable to a contract change. They authorized the construction of a single prototype of the new aircraft design designated MB5. The MB5 was given serial number R2496, which was originally allocated to the second and never-built MB3 aircraft. The third MB3 prototype was cancelled. The Martin-Baker MB5 was officially designed to the same Air Ministry Specification (F.18/39) as the MB3. Also, the aircraft’s construction closely followed the methods used on the MB3. The aircraft’s fuselage was made of a tubular steel frame with bolted joints. Attached to the frame were formers that gave the fuselage its shape. Aluminum skin panels were attached to the formers, and detachable panels were used wherever possible. A rubber seal attached to the formers ensured the tight fit of the detachable skin panels, which were secured by Dzus fasteners. The large and easily removed panels helped simplify the aircraft’s service and maintenance. Again, the MB5 is shown at Harwell. The original vertical stabilizer and rudder were very similar to those used on the MB3. The inner gear doors are not installed on the aircraft. The MB5’s wings were very similar to those used on the MB3, except that each housed only two 20 mm cannons with 200 rpg. All control surfaces used spring servo tabs; the rudder was fabric-covered, but all other control surfaces were metal-covered. The aircraft’s brakes, split flaps, and fully retractable landing gear were pneumatically controlled, and the air system operated at 350 psi (24.13 bar). The main wheels had a wide track of 15 ft 2 in (4.62 m). Two fuel tanks were housed in the aircraft’s fuselage: an 84 gallon (318 L) tank was positioned in front of the cockpit, and a 156 gallon (591 L) tank was positioned behind the cockpit. The cockpit was positioned directly above the wings and was enclosed with a bubble canopy. The cockpit had very good visibility, and its design was praised for the excellent layout of gauges and controls. The three main gauge clusters hinged downward for access and maintenance. The MB5 was powered by a Rolls-Royce Griffon 83 engine capable of 2,340 hp (1,745 kW) with 25 psi (1.72 bar) of boost and 130 PN fuel. 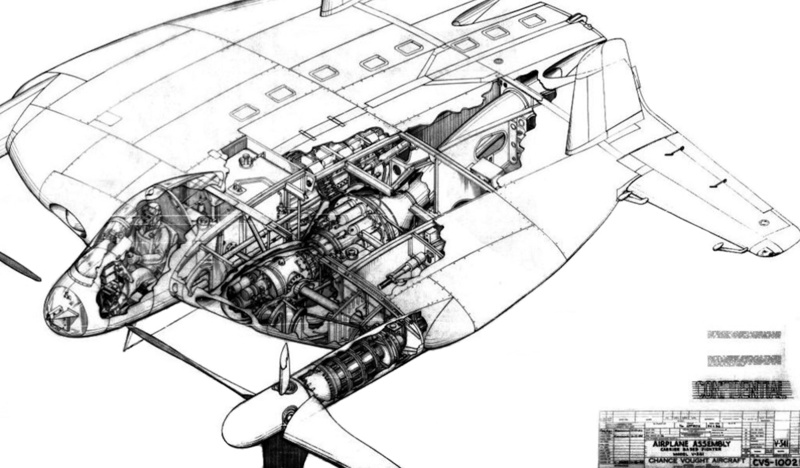 The engine originally turned a six-blade Rotol contra-rotating propeller, but by late 1945, a 12 ft 6 in (3.81 m) de Havilland contra-rotating unit was installed. A small scoop under the spinner brought in air to the Griffon’s two-speed, two-stage supercharger. The intercooler, radiator, and oil cooler were arranged, in that order, in a scoop under the fuselage. This arrangement provided some heat to the oil cooler when the engine was first started and prevented the oil from congealing and restricting the flow through the cooler. An intermediate modification to the MB5’s tail involved a more vertical leading edge that increased the fin’s area. This version of the tail did not last long before the completely redesigned unit was installed. The aircraft still has the Rotol propeller. The aircraft had a 35 ft (10.7 m) wingspan, was 37 ft 9 in (11.5 m) long, and was 14 ft 4 in (4.4 m) tall. The MB5 had a maximum speed of 395 mph (636 km/h) at sea level, 425 mph (684 km/h) at 6,000 ft (1,829 m), and 460 mph (740 km/h) at 20,000 ft (6,096 m). Normal cruising speed was 360 mph (578 km/h) at 20,000 ft (6,096 m). The aircraft stalled at 95 mph (153 km/h) clean and at 78 mph (126 km/h) with flaps and gear extended. The MB5 had an initial rate of climb of 3,800 fpm (19.3 m/s) and could reach 20,000 ft (6,096 m) in 6.5 minutes and 34,000 ft (10,363 m) in 15 minutes. The MB5’s service ceiling was 40,000 ft (12,192 m), and it had a range of around 1,100 miles (1,770 km). The aircraft had an empty weight of 9,233 lb (4,188 kg), a normal weight of 11,500 lb (5,216 kg), and an overload weight of 12,090 lb (5,484 kg). Construction of the MB5 started in 1943, and some components (possibly the wings and tail) of the second MB3 prototype were used in the MB5. The work on the aircraft was delayed because of other war work with which Martin-Baker was involved. In addition, Martin continued to refine and tinker with the MB5’s design, much to the frustration of the Air Ministry. However, the Air Ministry decided that Martin was going to do whatever he thought was right and that the best course of action was to leave him alone; the MB5 would be done when Martin decided it was done. The MB5 pictured close to its final form. The de Havilland propeller, inner gear doors, and taller vertical stabilizer and rudder have been installed. Note the smooth lines of the cowling. The position of the cockpit gave a good view over the aircraft’s nose and wings. Captain Baker was Martin-Baker’s only test pilot and was never replaced. As the MB5 neared completion in the spring of 1944, Rotol test pilot (Leslie) Bryan Greensted was loaned to fly the aircraft. On 23 May 1944, the MB5 was disassembled and trucked from Martin-Baker’s works in Denham to the Royal Air Force (RAF) station in Harwell. The aircraft was reassembled and underwent some ground runs. Later that same day, Greensted took the MB5 aloft for its first test flight. To disassemble, transport, reassemble, and flight test an aircraft all in one day speaks to the MB5’s impressive design. Greensted was not overly impressed with the aircraft’s first flight, because the MB5 exhibited directional instability; in fact, he said the aircraft “was an absolute swine to fly.” Martin listened intently to Greensted’s comments and immediately went to work on a solution. 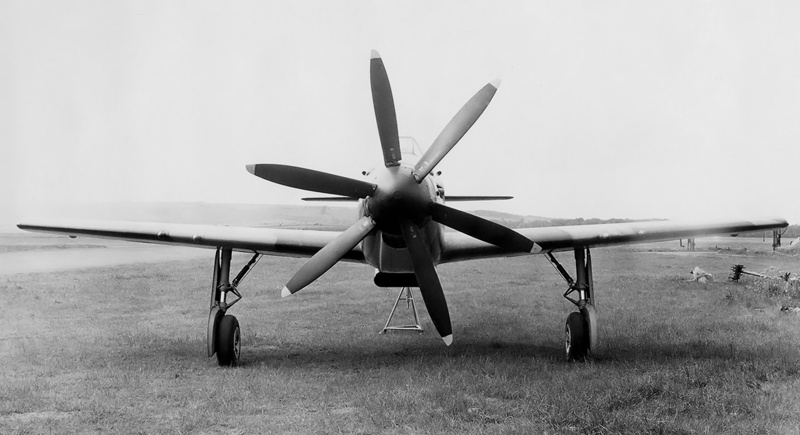 The increased blade area of the contra-rotating propellers had a destabilizing effect when coupled with the MB3 tail that was originally used on the MB5. To resolve the issue, Martin designed a taller vertical stabilizer and rudder, which were fitted to the MB5. The change took six months for Martin to implement, but when Greensted flew the aircraft, he was impressed by its performance and handling. In addition, a new horizontal stabilizer was fitted, but it is not known exactly when this was done. From its first flight until October 1945, the MB5 accumulated only about 40 flight hours. Martin-Baker had been informed around October 1944 that no MB5 production orders would be forthcoming, given that the war was winding down, and any production aircraft would most likely enter service after the war was over. 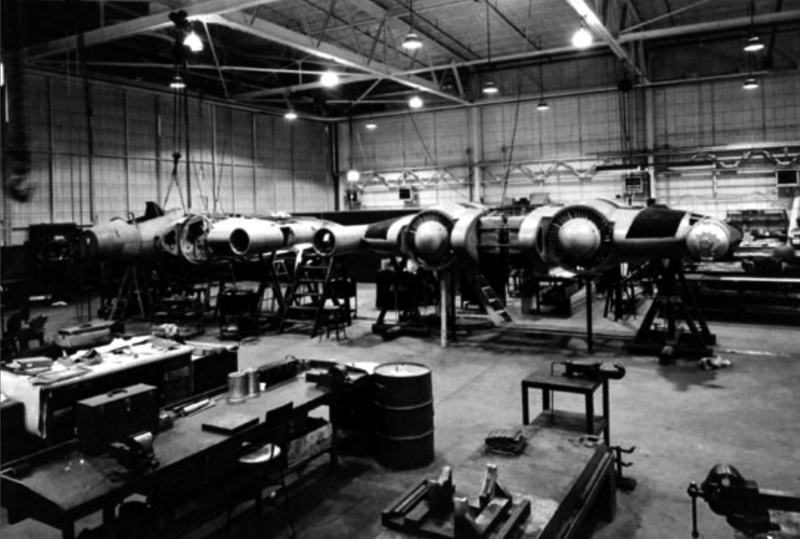 The MB5 undergoing maintenance. A large panel has been removed from under the aircraft, and one of the inner gear doors has also been removed. Note the Dzus fasteners on the cowling and that the spinner is now painted black. The small scoop under the spinner delivered air to the engine’s supercharger. Some sources state the MB5 was prepared for a speed run in the fall of 1945. 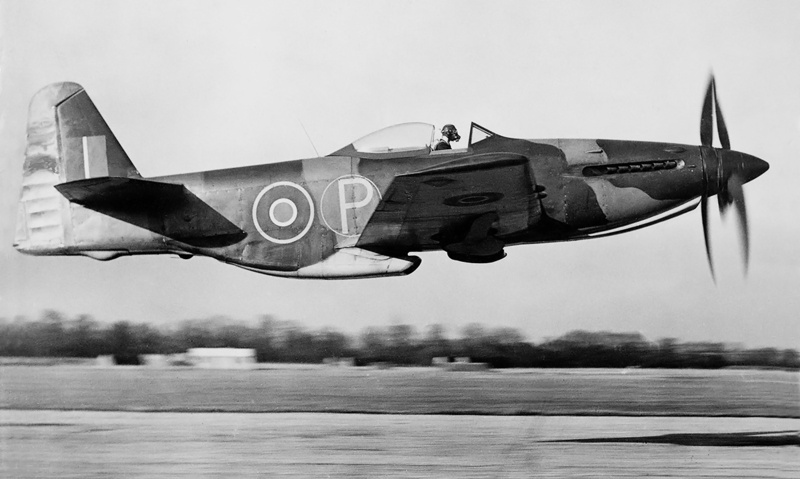 The Griffon engine was boosted to produce 2,480 hp (1,849 kW), and the aircraft reached 484 mph (779 km/h) on a measured course near Gloucester. However, the speed record claim seems highly doubtful. On 29 October 1945, the MB5 was one of the aircraft exhibited at the Royal Aircraft Establishment (RAE) Farnborough. It was the only aircraft present that had contra-rotating propellers. 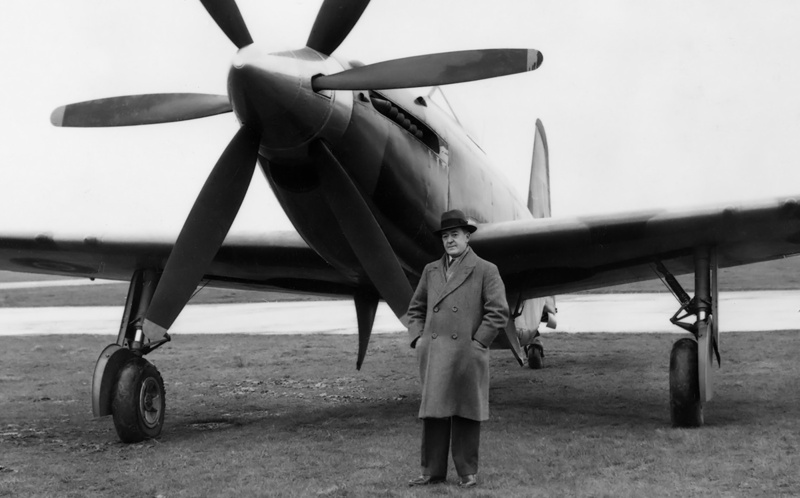 While Greensted was demonstrating the aircraft before Winston Churchill and RAF officials, the Griffon engine failed. With his vision obscured by oil and some smoke in the cockpit, Greensted jettisoned the canopy. The canopy flew back and struck the tail, but Greensted was able to land the MB5 without further damage. The MB5 had accumulated around 80 flight hours by the time it was handed over to the Aeroplane and Armament Experimental Establishment (A&AEE) at Boscombe Down. In March, April, and May 1946, the MB5 was flown by various pilots, and the aircraft’s performance and handling characteristics were well praised, but it was noted that the MB5’s acceleration and its roll rate were not quite on par with contemporary fighters. Overall, the tests showed that the MB5 was an excellent aircraft and that it was greatly superior from an engineering and maintenance standpoint to any other similar type. The MB5 was back at RAE Farnborough for an exhibition in June 1946. During the show, Polish Squadron Leader Jan Zurakowski flew the aircraft in a most impressive display and later stated that the MB5 was the best airplane he had ever flown. The MB5 was present at RAE Farnborough in October 1945. 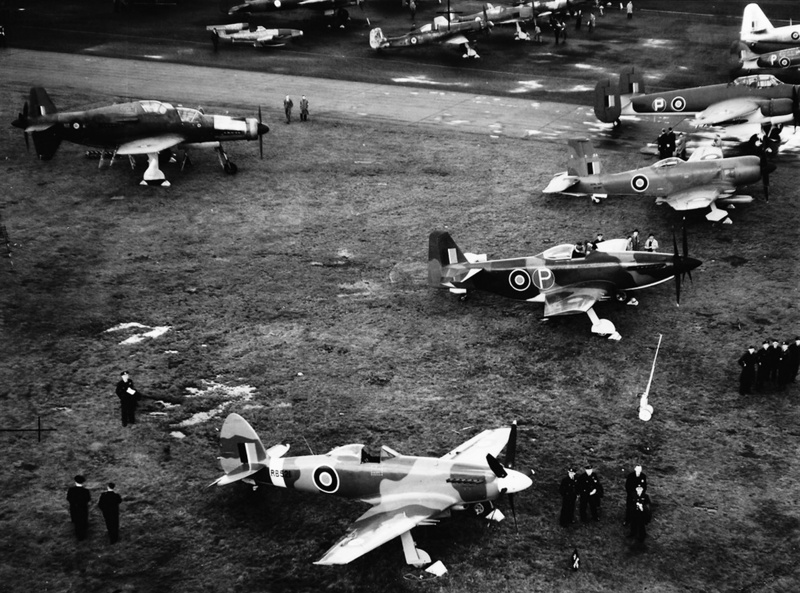 The display featured the latest British aircraft and several captured German aircraft. In the foreground is a Supermarine Spiteful and the MB5, with its 20 mm cannons installed. 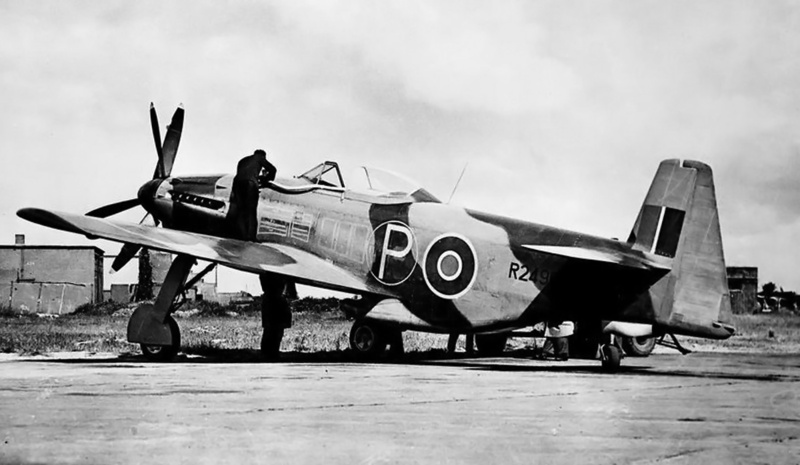 Other visible British aircraft include a Blackburn Firebrand, Bristol Brigand, Fairey Firefly, and Fairey Spearfish. Visible German aircraft include a Dornier Do 335, Fieseler Fi 103, Junker Ju 188, a pair of Focke-Wulf Fw 190s, and a Messerschmitt Bf 109. Many other British and German aircraft were present at the display. The MB5 was flown sparingly until a number of flights were made toward the end of 1947. Wing Commander Maurice A. Smith flew the aircraft during this time and highly regarded the MB5’s layout and performance. 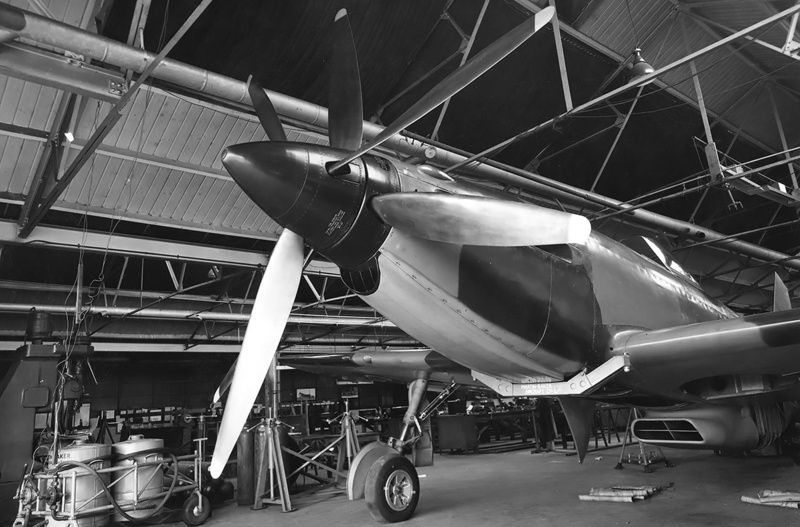 From mid-November to the end of 1947, the MB5 was loaned to de Havilland at Hatfield for propeller testing. In 1948, the aircraft returned to RAE Farnborough, where it was flown by legendary pilot Captain Eric ‘Winkle’ Brown. Although Brown was slightly critical of the aircraft’s lateral handling qualities, he said the MB5 was an outstanding aircraft and that he had never felt more comfortable in a new aircraft. On 5 May 1948, the MB5 was sent to the Air Ministry Servicing Development Unit at RAF Wattisham. There, it served as a training airframe until it was moved to RAF Bircham Newton around 1950. Reportedly, the MB5 was used as a ground target until its battered remains were burned in 1963—an inglorious end for such a fine aircraft. The MB5 taking off from Chalgrove in 1948 with Wing Commander Maurice A. Smith at the controls. The MB5’s flaps did not have any intermediate positions—they were either up or down. The 20 mm cannons have been removed. Note the belly scoop’s outward similarity to the scoop used on the P-51 Mustang. The Martin-Baker MB5 is one of a handful of aircraft that demonstrated superlative performance and flight qualities yet never entered production due to the end of World War II and the emergence of jet aircraft. It is quite impressive that the MB5 was created by a small firm that produced a total of four outstanding aircraft—each being a completely different model. Despite the quality of Martin-Baker’s aircraft and their best efforts to enter the aircraft manufacturing business, the MB5 was the company’s last aircraft. Martin-Baker turned their attention to other aircraft systems and became a pioneer and world leader in ejection seat technology. An MB5 replica has been under construction by John Marlin of Reno, Nevada for a number of years. Although not an exact copy, Marlin’s reproduction is a labor of love intended to commemorate one of the most impressive aircraft of all time and to honor all who created the original MB5. James Martin is pictured in front of his masterpiece, the MB5. Martin-Baker’s aircraft never found success; however, the company’s ejection seats have saved thousands of lives and are still in production. This entry was posted in Aircraft, World War II on 20 June 2017 by William Pearce. In the early 1930s, Charles H. Zimmerman became determined to design a low-aspect ratio, flying wing aircraft with a discoidal planform. The wing would have a short span and make up the aircraft’s fuselage. Zimmerman believed that large, slow-rotating propellers placed at the tips of the aircraft’s wings would cancel out wingtip vortices, provide uniform airflow over the entire aircraft, and effectively increase the aircraft’s span. In addition, the propellers would provide continuous airflow over the aircraft’s control surfaces even at very low forward velocities. The propellers were counter-rotating; viewed from the rear, the left propeller turned counterclockwise and the right propeller turned clockwise. The envisioned aircraft would be able to execute short takeoffs and landings, maintain control at very low speeds, and have a high top speed. Zimmerman’s ultimate goal was a high-speed aircraft that could ascend and descend vertically and could hover. 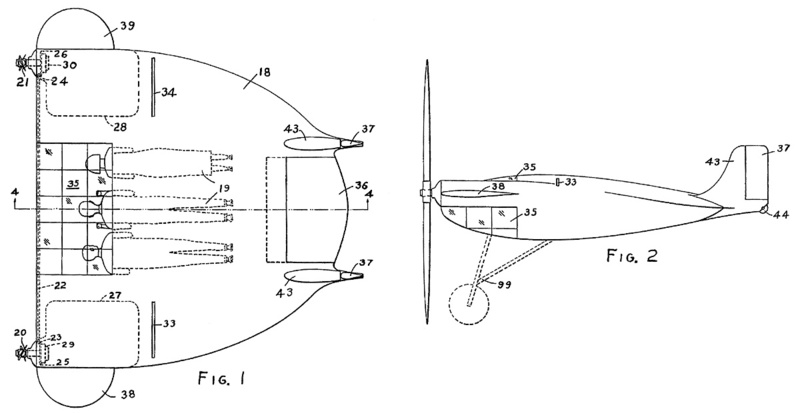 Drawings from Charles Zimmerman’s 1935 patent showing his low-aspect ratio, flying wing aircraft. Note the three occupants lying in a prone position. The aircraft’s layout was very similar to the Vought V-173. The power transfer shaft (22) can been seen connecting the two propeller shafts. While working at the National Advisory Committee for Aeronautics (NACA), Zimmerman won a design competition in 1933 for a light, general aviation aircraft. However, his low-aspect ratio design was deemed too radical to be built. Undeterred, Zimmerman designed a three-place aircraft in which the occupants lay in a prone position. Zimmerman called this aircraft the Aeromobile. 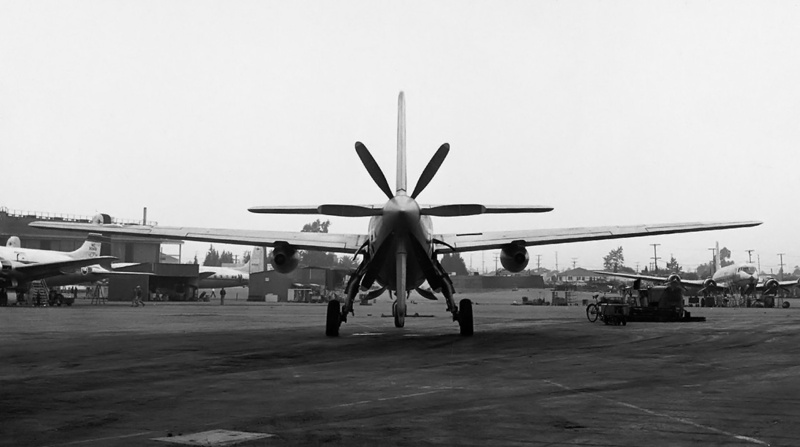 The aircraft’s propellers were forced to rotate at the same speed via a power cross shaft that linked the engine’s propeller shafts together. Each engine could be disconnected from its respective propeller shaft in the event of an engine failure. 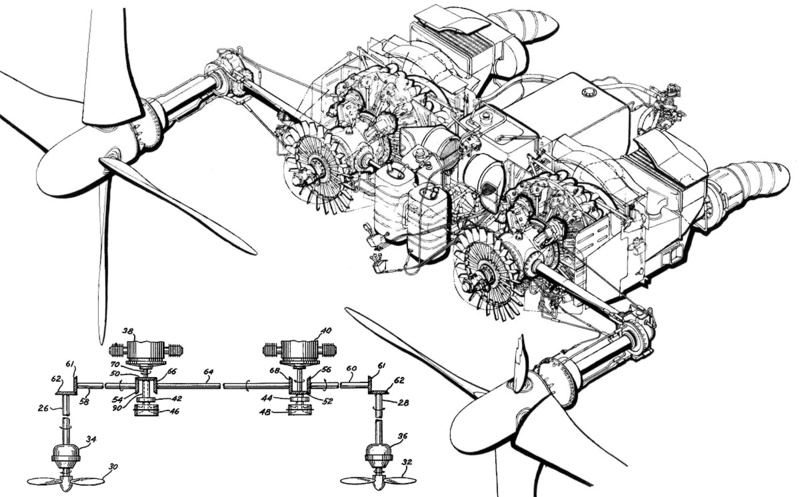 The power cross shaft would distribute power from the functioning engine to both propellers. To test his theories, Zimmerman and some friends built a small proof-of-concept aircraft based on the three-place design. The aircraft had a short 7 ft (2.1 m) wingspan and was powered by two 25 hp (19 kW), horizontal, two-cylinder Cleone engines. Despite several attempts, the aircraft was unable to takeoff. The difficulties were caused by an inability to synchronize the propellers, as the power cross shaft was omitted due to the aircraft’s small size. The proof-of-concept aircraft built to test Zimmerman’s theories. This image illustrates the aircraft’s 7 ft (2.1 m) wingspan. Due to trouble with synchronizing the engines/propellers, the aircraft was not flown. Charles Zimmerman is on the right side of the image. Following the unsuccessful trials of small aircraft, Zimmerman took a step back and turned to models. By 1936, he had a rubber band-powered scale model with a 20 in (508 mm) wingspan routinely making successful flights. Others at NACA reviewed Zimmerman’s work and encouraged him to seek financial backing from the aviation industry to further develop his designs—as an individual, his efforts to interest the US Armed Forces had not been successful. Zimmerman found support from Vought Aircraft and was hired on to continue his work in 1937. Again, the radical nature of Zimmerman’s designs made the establishment question their worth. The US Army Air Corps turned down various proposals, but the US Navy could not overlook the fact that a short wingspan fighter with a short takeoff distance, a very low landing speed, and a high top speed would be ideal for carrier operations. In fact, such an aircraft could operate from just about any large ship. In 1938, the Navy funded the Vought V-162, which was a large model to further test Zimmerman’s ideas. The model was powered by electric motors and took two people to operate. The model sufficiently demonstrated Zimmerman’s design, and the Navy contracted Vought to build a full-size test aircraft on 4 May 1940. The aircraft was designated V-173 by Vought and was given Bureau Number (BuNo) 02978 by the Navy. 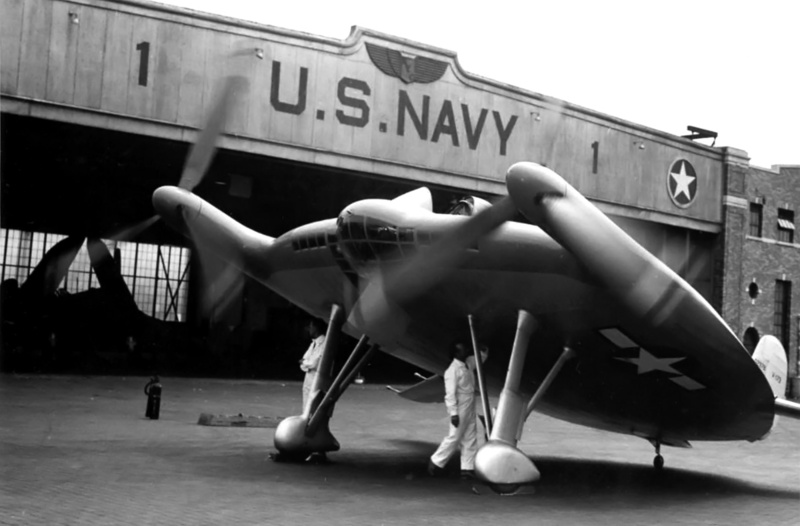 The airframe of the Vought V-173 was made mostly of wood, but the forward cockpit structure and propeller nacelles were made of aluminum. The front part of the fuselage back to the middle of the cockpit was covered with wood, and the rest of the aircraft was fabric-covered. Originally, the pilot was to lie in a prone position, but this was changed to a more conventional, upright seat. The lower leading edge of the aircraft had glazed panels to improve visibility from the cockpit while the V-173 was on the ground. Cockpit entry was via a hatch under the aircraft, but the canopy also slid back. Housed in the aircraft’s fuselage were two 80 hp (60 kW) Continental C-75 engines. Most sources list the engines as Continental A-80s, but C-75s were actually installed in the aircraft. The 80 hp (60 kW) rating was achieved through the use of fuel injection. The C-75 was a flat, four-cylinder, air-cooled engine that displaced 188 cu in (3.1 L). One engine was on each side of the cockpit. The engines were started by pulling a handle through an access panel under the aircraft. Each engine had a cooling fan attached to its output shaft, and engine cooling air was brought in through inlets in the aircraft’s leading edge. The air exited via flaps in the upper fuselage. Via shafts and right angle drives, the engines powered two 16 ft 6 in (5.06 m), three-blade, wooden propellers at around .167 times engine speed. The variable-pitch propellers turned around 450 rpm at maximum power (2,700 engine rpm) and around 415 rpm at cruise power (2,500 engine rpm). The individual blades could articulate (flap) automatically to compensate for side gusts and uneven loading. The blades were hinged inside the propeller hub in which hydraulic dampers limited their articulation. The rake (or coning) angle of the blades could be adjusted on the ground. This moved the tips of the blades either forward or aft relative to the propeller hub. A power cross shaft that ran just behind the cockpit connected the engine gearboxes. The cross shaft ensured that power was delivered equally between the two propellers, and it also synchronized propeller rpm. A failed engine would automatically declutch from the propeller drive system, and the remaining engine would power both propellers. The left engine was started first and then clutched to the propeller drive system. The right engine was then started and automatically clutched to the propeller drive system after it came up to speed. 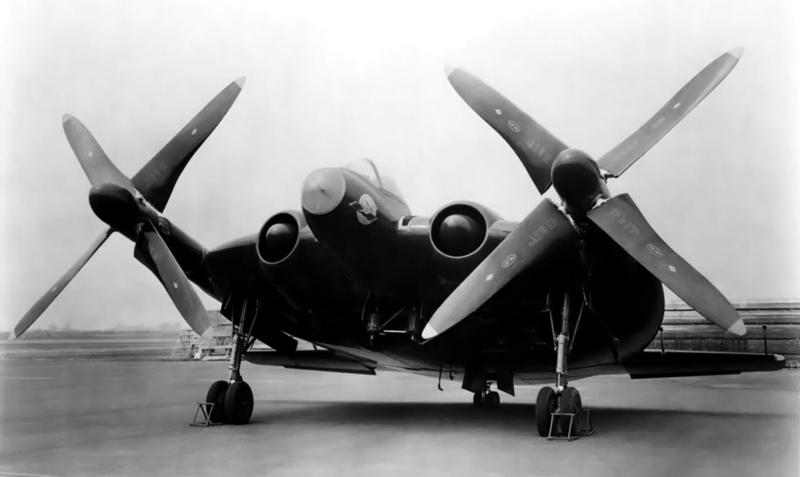 Under the V-173 were two very long fixed main gear legs that supported the aircraft at a 22.25 degree angle while it sat on the ground. At the rear of the aircraft were two vertical stabilizers. Attached to each side of the V-173 was a horizontal stabilizer with a surface that acted as both an aileron and an elevator (ailavator or ailevator). The ailavators were not part of the initial V-173 design (and were not on the V-162 model), but early model tests indicated that the flight controls were needed. View of the V-173 on an early test flight that shows no stabilizing flaps between the tails. Note the deflection angle of the ailavator; the V-173 always flew at a nose-high angle because it was underpowered. The V-173 had a wingspan of 23 ft 4 in (7.1 m) but was about 34 ft 9 in (10.6 m) wide from ailavator to ailavator. The aircraft was 26 ft 8 in (8.1 m) long and 12 ft 11 (3.9 m) in tall. The V-173 could take off in 200 ft (61 m) with no headwind, and it could lift right off the ground with virtually no roll in a 30 mph (48 km/h) headwind. The aircraft’s top speed was 138 mph (222 mph), and cruising speed was 75 mph (121 km/h). With normal prevailing winds, the V-173 would routinely take off in 20 ft (6 m) and land at 15 mph (24 km/h). The aircraft had an empty weight of 2,670 lb (1,211 kg) and a normal weight of 3,050 lb (1,383 kg). 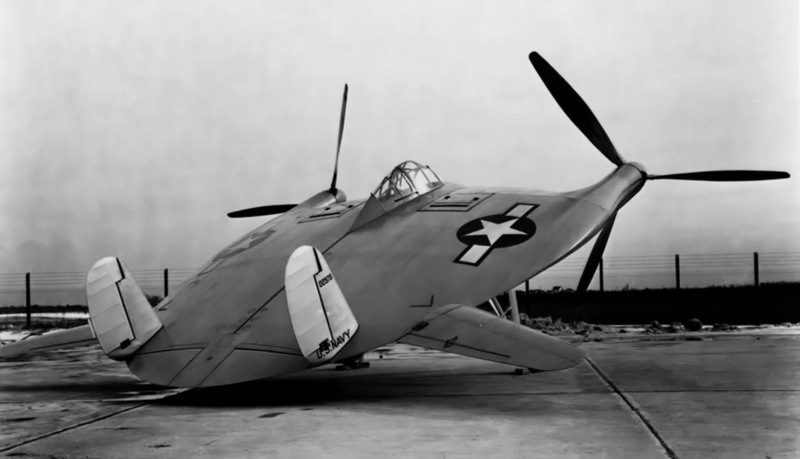 The V-173 only carried 20 gallons (76 L) of fuel in two 10 gallon (38 L) tanks. 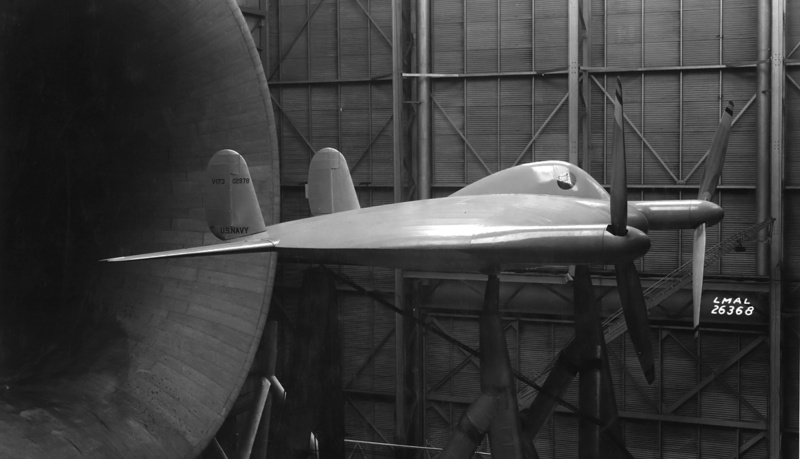 In November and December 1941, the V-173 was tested in NACA’s Langley wind tunnel in Hampton, Virginia. 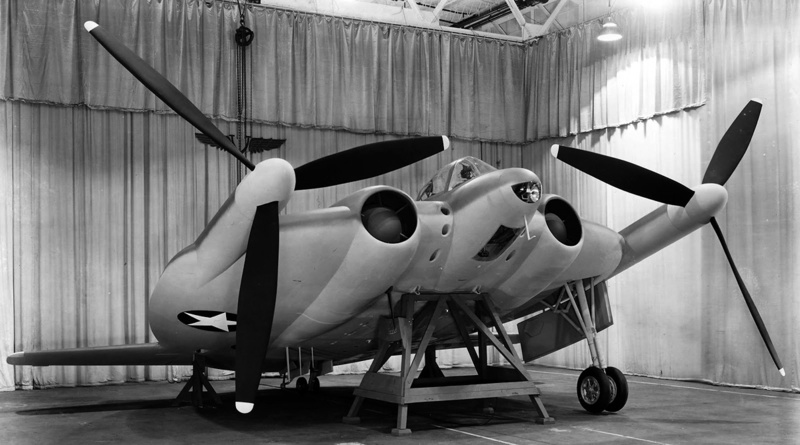 The aircraft had its original two-blade propellers, but these were found to be insufficient and were replaced by three-blade units shortly after the tests. Two small control surfaces that made up the trailing edge of the aircraft were present between the tails. However, these were removed before the V-173’s first flight. 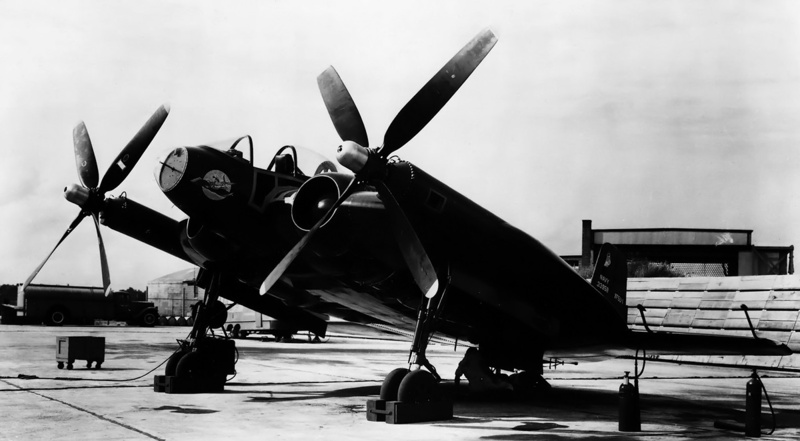 The Navy was encouraged enough by the wind tunnel tests that they asked Vought to prepare a proposal for a fighter version of the aircraft, which eventually became the Vought XF5U-1. The V-173 is shown with redesigned ailavators and the stabilizing flaps installed. The cooling air exit flaps can be seen near the cockpit. The two ports forward of each cooling air exit flap were for engine exhaust. After an extended period of taxi tests, the V-173’s first flight took place on 23 November 1942 at Bridgeport Airport (now Sikorsky Memorial Airport) in Stratford, Connecticut, with Vought test pilot Boone T. Guyton at the controls. Guyton found the aircraft’s controls extremely heavy and thought that he might need to make a forced landing. Fortunately, He had enough control to make a large circuit and land the aircraft after 13 minutes of flight. Adjustments to the propellers were made, and the ailavators were redesigned as all-moving control surfaces with servo tabs. These changes improved aircraft control, but landing the V-173 was still difficult. As it approached the ground, air would get trapped under the aircraft and force the tail up. Subsequently, the nose of the aircraft would drop, causing the V-173 to rapidly descend the last few feet. The aircraft would hit the runway harder than intended and bounce back into the air. After about 40 flights, the two stabilizing flaps were added between the aircraft’s tails. 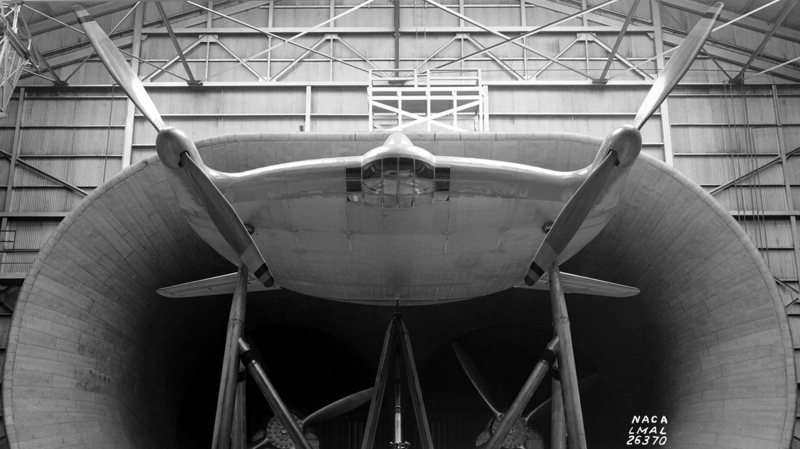 The flaps were larger than the control surfaces tested in the wind tunnel, and they were separated by the tailwheel. When the aircraft was near the ground, air loads acted on spring-loaded struts to automatically deflect the stabilizing flaps up and allow air to escape from under the aircraft. A number of different pilots, including Charles Lindberg, flew the V-173. Over its flight career, the aircraft did experience a few difficult landings that resulted in minor damage. The most serious issue occurred on 3 June 1943 when Vought-pilot Richard Burroughs made an emergency landing on Lordship Beach, Connecticut. Vapor lock had caused fuel starvation and subsequent engine failure. Immediately after touchdown, Burroughs flipped the V-173 onto its back to avoid hitting a sunbather. No one was injured, and the aircraft was not seriously damaged. The V-173 undergoing an engine run. The engine cooling air intakes can be seen in the aircraft’s leading edge. The canopy is open, and the cockpit access hatch on the aircraft’s underside is also open. Note that the stabilizing flaps are deflected up and that streamlined fairings have been fitted to cover the wheels. Overall, the V-173 flew as expected, but it was not entirely like a conventional aircraft. The V-173 was underpowered, and there were unresolved vibration issues caused by the propeller gearboxes and drive shafts. The aircraft made around 190 flights and accumulated 131 hours of flight time. The V-173 made its last flight on 31 March 1947. The Navy kept the aircraft in storage at Norfolk Naval Air Station, Virginia for a number of years and gave it to the National Air and Space Museum in September 1960. 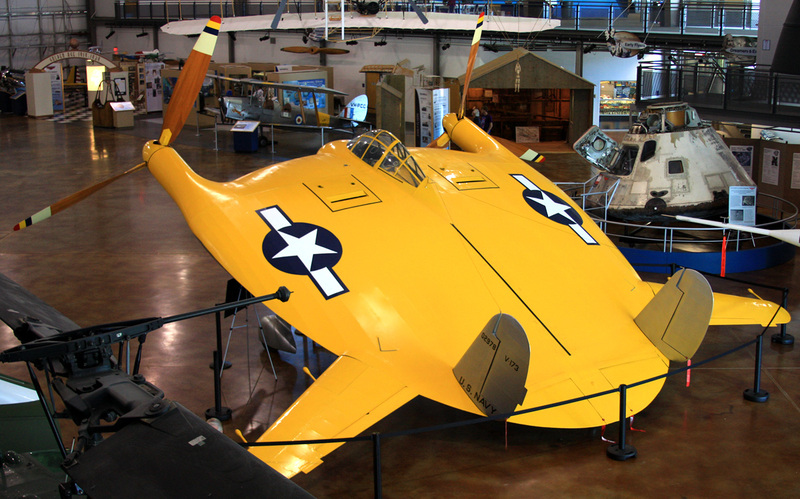 The V-173 was stored at the Paul E. Garber Facility in Suitland, Maryland until 2003, when it was moved to Vought’s Grand Prairie facility near Dallas, Texas for restoration by the Vought Aircraft Heritage Foundation. Restoration was completed in February 2012, and the aircraft was loaned to Frontiers of Flight Museum in Dallas, where it is currently on display. Zimmerman’s aircraft were given several nicknames during their development: Zimmer’s Skimmer, Flying Flapjack, and Flying Pancake. Test pilot Guyton said that the V-173 could fly under perfect control while maintaining a 45 degree nose-up angle with full power and full aft stick. 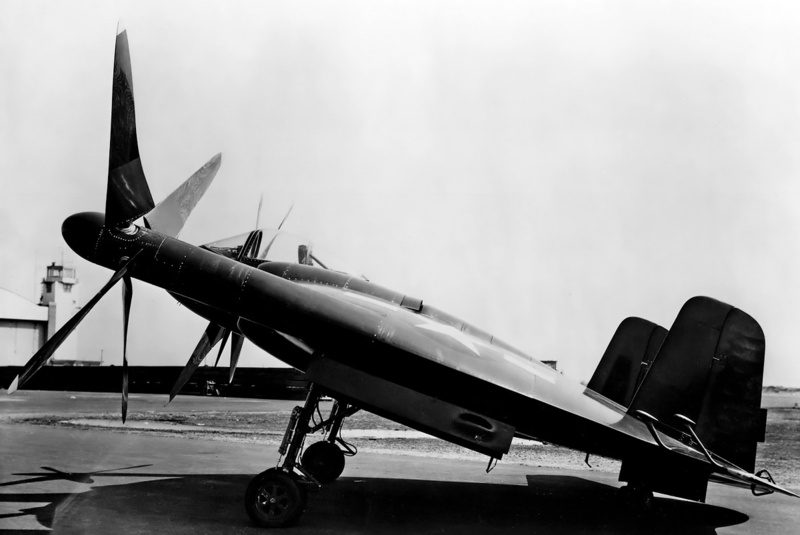 During the flight test program, the pilots were not able to make the V-173 stall completely or enter a spin. The aircraft rapidly decelerated in sharp turns, and this could prove advantageous in getting on an opponent’s tail during a dogfight. But if the shot were missed, the aircraft could be at a disadvantage because of its decreased speed. 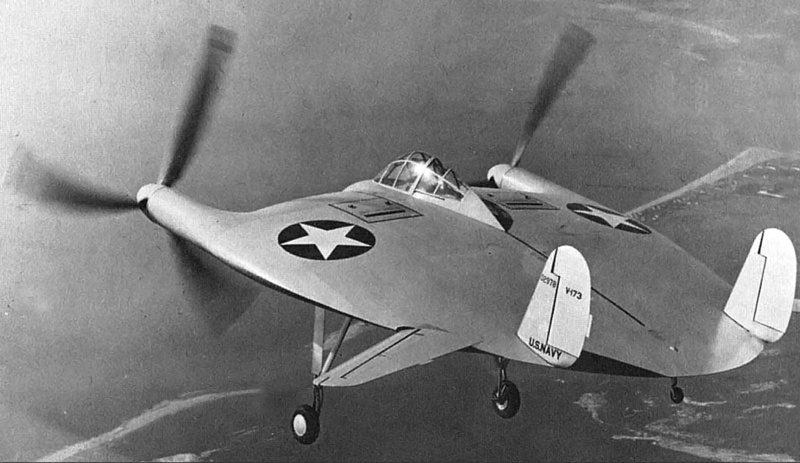 The V-173 proved the viability of Zimmerman’s low-aspect ratio, flying wing aircraft concept, provided much information on how to refine the design, and directly contributed to the Vought XF5U-1. This entry was posted in Aircraft, Between the Wars, World War II on 20 January 2017 by William Pearce. In the late 1930s, designers at Arsenal de l’Aéronautique in France began working on a new fighter powered by two engines installed in tandem. One engine was positioned in front of the cockpit, and the other engine was behind the cockpit. Each engine drove half of a coaxial contra-rotating propeller. This design was eventually developed into the Arsenal VB 10. Takeo Doi was a Japanese designer at Kawasaki and was aware of Arsenal’s tandem-engine design. 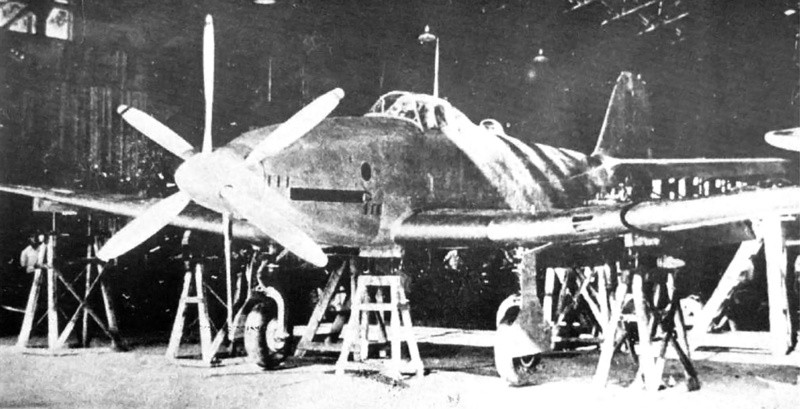 The Kawasaki Ki-64 fighter undergoing gear retraction tests in a hangar in Gifu. Note the exhaust stacks for the front engine and the dorsal air intake scoop for the rear engine. Doi was also aware of the evaporative cooling system used on the German Heinkel He 100. Japan had sent a delegation to Germany in December 1938 that successfully negotiated the purchase of three He 100 and two He 119 aircraft. The He 100s were delivered to Japan in the summer of 1940. 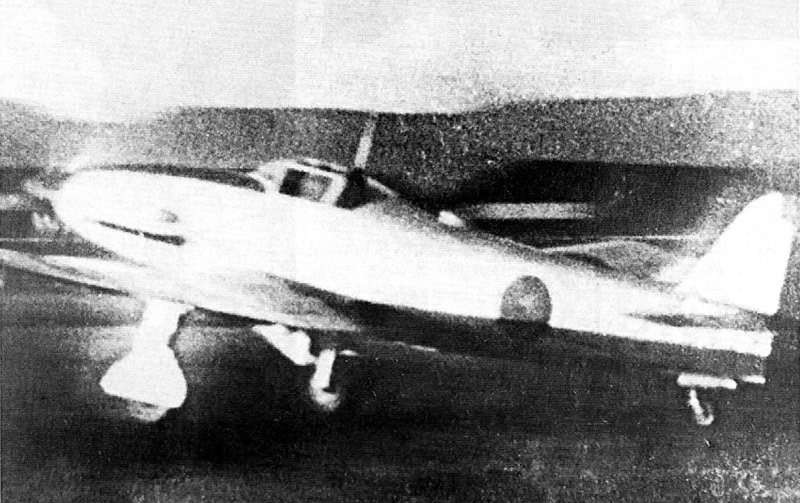 In 1939, Doi began to contemplate a high-speed fighter for the Imperial Japanese Army Air Force that used tandem engines and evaporative cooling. At the time, the Japanese aircraft industry was more focused on conventional aircraft, and Kawasaki and Doi were busy with designing the Ki-60 and Ki-61 Hien (Swallow, or Allied code name “Tony”) fighters. In October 1940, Kawasaki and Doi received support for the tandem-engine fighter project, which was then designated Ki-64 (Allied code name “Rob”). The aircraft’s design was refined, and a single Ki-64 prototype was ordered on 23 January 1941. The Kawasaki Ki-64 looked very much like a continuation of the Ki-61 design, and while some of its features were inspired by other aircraft, the Ki-64 was an entirely independent design. The single-seat aircraft had a taildragger configuration and was of all-metal construction. Although designed as a fighter, the Ki-64 was primarily a research aircraft intended to test its unusual engine installation and evaporative cooling system. Proposed armament included one 20 mm cannon installed in each wing and two 12.7 mm machine guns or 20 mm cannons installed in the upper fuselage in front of the cockpit. The armament was never fitted to the prototype. The Ki-64 appears to be preparing for an early test flight. The front engine’s intake scoop can be seen just above the exhaust stacks. Note the exhaust stains from the front engine and that the lightning bolt has not yet been painted on the fuselage. The Ki-64 was powered by a Kawasaki Ha-201 (joint designation [Ha-72]11) engine that was comprised of two Kawasaki Ha-40 inverted V-12 engines coupled to a coaxial contra-rotating propeller. The Ha-40 (joint designation [Ha-60]22) was a licensed-built Daimler-Benz 601A engine and had a 5.91 in (150 mm) bore, a 6.30 in (160 mm) stroke, and a displacement of 2,070 cu in (33.9 L). As installed in the Ki-64, the shaft for the rear engine extended under the pilot’s seat and through the Vee of the front engine to the propeller gearbox. 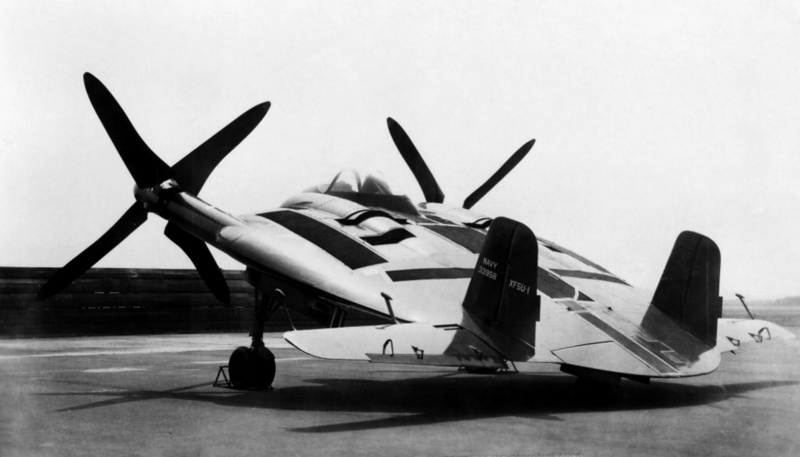 The rear engine drove the front adjustable-pitch propeller of the contra-rotating unit. The front engine drove the rear fixed-pitch propeller. Each set of propellers had three blades that were 9 ft 10 in (3.0 m) in diameter. The Ha-201 displaced a total of 4,141 cu in (67.9 L) and produced 2,350 hp (1,752 kW) at 2,500 rpm for takeoff and 2,200 hp (1,641 kW) at 2,400 rpm at 12,795 ft (3,900 m). Each engine section could operate independently of the other. The engine sections had separate evaporative cooling systems. Heated water from the engine at 45 psia (3.1 bar) was pumped to a steam separator, where the water pressure dropped to 25 psia (1.7 bar), and about 2% of the water flashed to steam. The steam was then ducted at 16 psia (1.1 bar) through panels in the wings, where it was cooled and condensed back into water. The water then flowed back into the engine. The evaporative cooling system eliminated the drag of a radiator, and this enabled the aircraft to achieve higher speeds. It was believed that battle damage would not be much of a problem for the cooling system. The low pressure of the steam combined with steam’s low density meant that the amount of coolant lost through a puncture would be minimal, and the separate engines and cooling systems helped minimize the risk of a forced landing if damage did render one system ineffective. The evaporative cooling system for the front engine was housed in the left wing, and the rear engine’s system was housed in the right wing. Each system consisted of two steam separators, an 18.5-gallon (70 L) tank in the wing’s leading edge near the fuselage, four upper and four lower wing condenser panels, an upper and lower condenser section in the outer flap, and a water tank in the fuselage. Sources disagree regarding the size of each fuselage tank, but combined, the tanks held around 52.8 gallons (200 L). Suspended below the right wing was a scoop that held oil coolers for the engines. Another image of the Ki-64 doing a ground run. Note the aircraft’s resemblance to a Ki-61 Hien. Exhaust for the rear engine was collected in a manifold that exited the fuselage just above where the trailing edge of the wing joined the fuselage. That exhaust exit can just barely be discerned in this image. The Ki-64 had a 44 ft 3 in (13.50 m) wingspan and was 26 ft 2 in (11.03 m) long. The aircraft had a top speed of 435 mph (700 km/h) at 13,123 ft (4,000 m) and 429 mph (690 km/h) at 16,404 ft (5,000 m). The Ki-64 could climb to 16,404 ft (5,000 m) in 5.5 minutes and had a service ceiling of 39,370 ft (12,000 m). Since the wings housed the cooling system, little room was left for fuel tanks. Each wing had a 22-gallon (85 L) fuel tank, and an 82-gallon (310 L) tank was housed in the fuselage; this gave the Ki-64 a 621 mile (1,000 km) range. The aircraft weighed 8,929 lb (4,050 kg) empty and 11,244 lb (5,100 kg) loaded. While the Ki-64 was being built, a Ki-61 was modified to test the evaporative cooling system. With its radiator removed and evaporative panels added to its wings, the modified Ki-61 first flew in October 1942. Around 35 flights were made before the end of 1943, and they served to develop and refine the cooling system. The aircraft proved the validity of the evaporative cooling system and achieved a speed 25–30 mph (40–48 km/h) in excess of a standard Ki-61. However, the evaporative cooling system did require much more maintenance than a conventional system. The Ki-64 was completed at Kawasaki’s plant at Gifu Air Field in November 1943. The aircraft underwent ground tests that revealed a number of issues. By December, the issues were resolved enough for flight testing to commence. The aircraft made four successful flights, but the rear engine caught fire on the fifth flight. The pilot was able to make an emergency landing at Kakamigahara, but the rear engine and parts of the rear fuselage and cooling system had been damaged. The Ha-201 engine was sent to Kawasaki’s engine plant in Akashi for overhaul, and the Ki-64 airframe was sent back to Gifu for repairs. 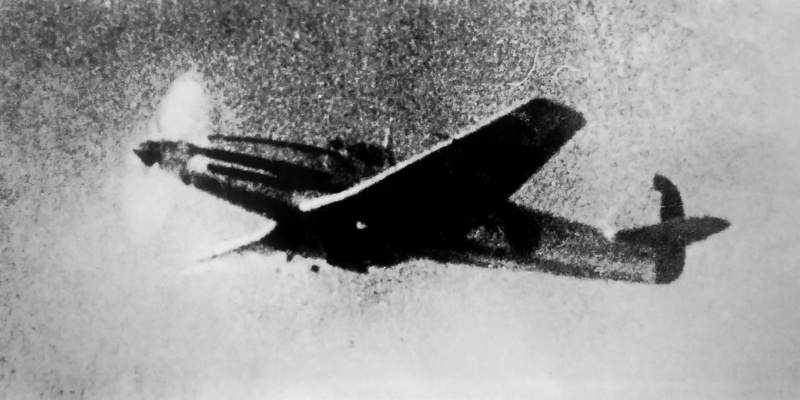 A poor image, but perhaps the only one, showing the Ki-64 in flight. The lightning bolt has been painted on the fuselage. The short flying career of the Ki-64 had shown that its cooling system was insufficient. The system worked well for level flight, but it was inadequate for ground running, takeoff, and climb. When the system was overloaded, steam was not condensed back to water and was subsequently vented overboard via a 16 psi (1.1 bar) relief valve. The cooling system lost about 12 gallons (45 L) of water during a rapid climb from takeoff to 18,000 ft (5,500 m). Water freezing within the system, either while in flight or on the ground during cold temperatures, was another concern. Adding an alcohol mixture to the water coolant was a possible solution, but the Ki-64 never underwent any cold weather testing. 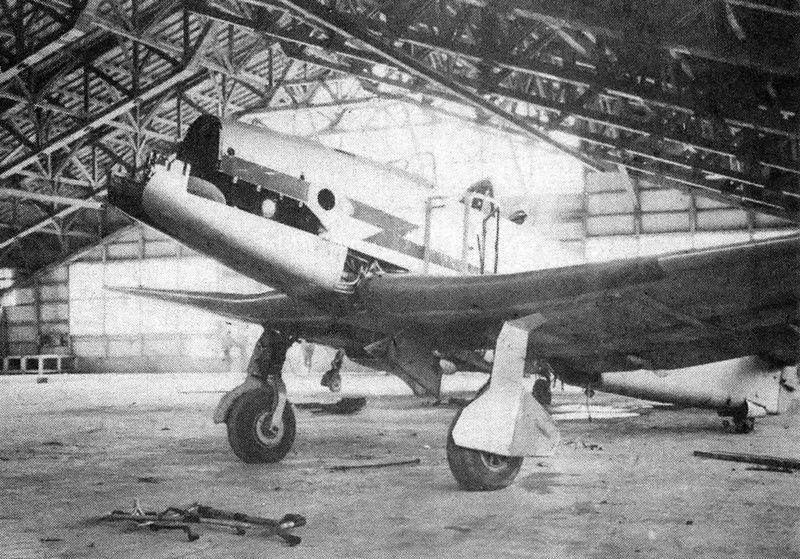 While undergoing repairs, the Ki-64 was to be modified and redesignated Ki-64 Kai. The existing propellers would be replaced with fully adjustable and feathering contra-rotating propellers, which would make it easier for one engine to be shut down in flight. The engines were to be replaced with more powerful Ha-140s (joint designation [Ha-60]41), each of which was capable of 1,500 hp (1,119kW). The coupled engine was designated Ha-321 (joint designation [Ha-72]21) and produced 2,800 hp (2,088 kW). With the changes, it was estimated that the Ki-64 Kai would have a top speed of 497 mph (800 km/h). However, the propeller and engines were delayed by more pressing war-time work, and the Ki-64 program was cancelled in mid-1944. The Ki-64 airframe remained at Gifu where it was captured by American forces in 1945. 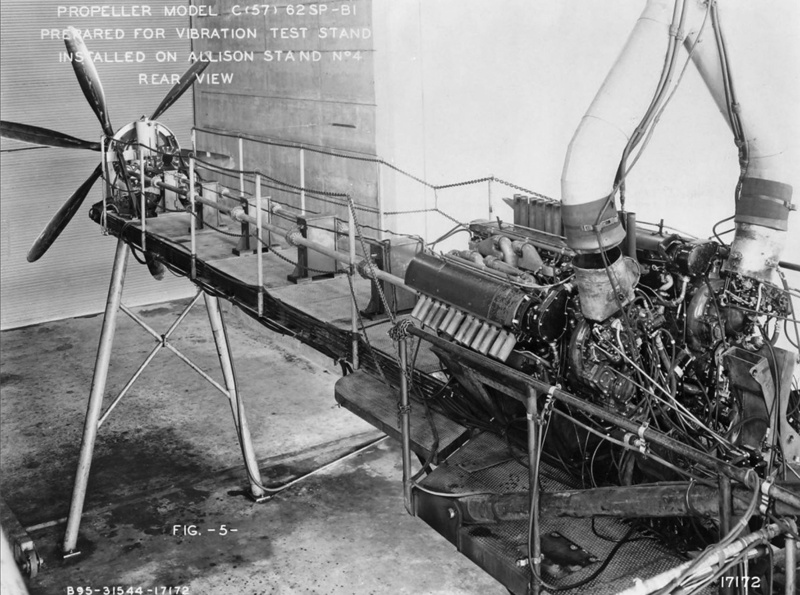 Various parts of the cooling system were removed from the aircraft and shipped to Wright Field in Dayton, Ohio for further analysis and testing. The remainder of the Ki-64 was eventually scrapped. The K-64 as discovered by American forces at the end of World War II. The engines had been removed, and the aircraft was in a rather poor state. Note the canopy frame sitting on the wing. This entry was posted in Aircraft, World War II on 20 October 2016 by William Pearce.